In baseball parlance a journeyman is a player who is experienced, reliable, and a good, solid performer, as distinguished from one who is a brilliant or colorful star. Chick Fulmer was a prototypical journeyman ballplayer. He had his colorful moments, but mostly he was just a clever, dependable teammate of more flamboyant players, whom he sometimes rescued from jams of their own making. Charles John “Chick” Fulmer was born in Philadelphia on February 12, 1851, and made that city his home for almost his entire life. He was the youngest of five children of Sarah (Pedrick) Fulmer and Michael Fulmer II and a grandson of Anna Maria (Krouskop) Fulmer and John Fulmer. Anna Maria’s family were known as Pennsylvania Dutch. Her parents, Margaretha and Johnan Georg Krouskop, were born in Germany. On the other hand, the Fulmers were descendants of English aristocracy and proudly displayed their coat of arms on their family tree. The Fulmers who came to America were not aristocrats, however. They were American patriots. Generation after generation the family lived in Philadelphia, home of the Liberty Bell and Independence Hall. And the men fought in America’s wars. Chick played baseball for clubs based in 10 different cities, but he always called Philadelphia home. Chick’s great-grandfather, Michael Fulmer, served in the French and Indian War. As a teenager John Fulmer was a volunteer in the Colonial army, making his descendants eligible for membership in the Sons of the American Revolution. Michael Fulmer II served in a Pennsylvania regiment in the Union Army during the Civil War, entering the fray as a lieutenant and receiving a promotion to captain. His three eldest sons, Washington Fayette Fulmer (presumably named for Revolutionary War heroes George Washington and the Marquis de Lafayette), Henry, and William, also served in Pennsylvania regiments during the conflict. Youngest son Charles Fulmer was not old enough to serve in the army, so he enlisted with the Southwark Guards as a drummer boy, but was discharged before his unit saw any action when it was discovered that the lad was only 14 years of age. It is not known when Charles acquired the nickname Chick. Charley, Charlie, Chuck, and Chick have long been used as nicknames for Charles, so it is not surprising that the lad was tagged with that cognomen. Nor is it known when Chick first started playing baseball. During his boyhood, Philadelphia was a hotbed of amateur baseball. It is likely that the Fulmer brothers played on local clubs. At any rate, two of the siblings reached the major leagues – one for a long career, the other for a one-day stand. The name Charles Fulmer first appears in the census for 1860. The 10-year-old was living with his mother and his father, a butcher, in Philadelphia, along with Washington, age 20, a dairyman; Henry, 18, a butcher; 16-year-old William, not employed; and 14-year-old sister Emeline, who like Charles, was at school. The 1870 census reports for that section of Philadelphia are illegible. In 1869 Fulmer first appeared on the roster of a professional baseball club. At the age of 18, he played in 11 games for the Keystone club of his native Philadelphia. In 1870 he appeared in eight games for the Forest City club of Cleveland, playing right field. Both the Keystones and the Forest Citys were members of the short-lived National Association of Base Ball Players, a loosely organized aggregation of clubs that did not play a regular schedule. It was not a real league, in the sense that the term is understood today. Fulmer stayed with the Philadelphia club until the unstable National Association disbanded after the 1875 season. He played mainly shortstop and third base for the Athletics, although he pitched in two games, and played one game each at first base and as catcher. The term “one-and-done” is usually associated with John Calipari, the University of Kentucky basketball coach who frequently recruits high-school players, brings them to campus for one year, then sees them sign with professional clubs. One year and they are done with college basketball. Chick Fulmer’s brother Washington stretched the one-and-done concept to a point that Calipari probably could only imagine. On July 19, 1875, Washington Fulmer played center field for the Atlantics of Brooklyn. He had four at-bats, made two hits, scored one run, and batted in one run. It was the first, last, and only game of professional baseball he ever played. That is an example of “one-and-done” carried to the ultimate extreme. When the National League replaced the Association in 1876, Fulmer became the shortstop for the Louisville Grays. He lasted only one year in Kentucky. 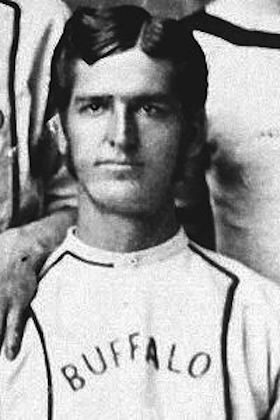 In 1877 Fulmer was out of the majors, playing for Pittsburgh in the International Association and Philadelphia in the League Alliance. In 1878 he was with Buffalo in the International Association. Meanwhile, the National League expelled Cincinnati from the league after the club refused to stop selling beer on the grounds and renting out the park for Sunday games. Cincinnati sportswriter Oliver Perry Caylor led the agitation for the creation of a new, more liberal league. He was successful. In 1882 a new major league entered the arena, the American Association, popularly known as the Beer and Whiskey League. The Cincinnati Reds of the new circuit added Chick Fulmer to its roster. Fulmer got his last shot at the majors, and he made the most of the opportunity. Playing shortstop for the Reds, with some illustrious teammates, Fulmer helped Cincinnati win the pennant in the new league’s first year. One month later Fulmer pulled off a famous scam. The Reds were scheduled to open a series with Columbus on the afternoon of July 21. Third baseman Hick Carpenter missed the train carrying the Reds from St. Louis to Columbus. The third sacker wired manager Pop Snyder that the earliest he could arrive in Columbus would be 4 o’clock, the exact time the game was to begin. By then Snyder would have to have his lineup in place. Under the 1873 rules no substitutions were permitted after the game began, except in the case of emergencies, such as illness or injury. How could the Reds delay the start of the game until Carpenter arrived? Fulmer came to the rescue. He told the manager, “I don’t feel very well, and may be real bad at 4 o’clock.” When game time came, Fulmer was in the clubhouse, groaning and complaining of terrible cramps. His teammates gave him doses of ginger, hoping to get him in condition to play. The Columbus manager went out on the field and apologized for the delay, explaining how desperately ill the Cincinnati shortstop was. The two pennant winners of 1882, the Cincinnati Reds of the new American Association, and the Chicago White Stockings of the established National League, met in two postseason exhibition games. The contests have been called the first World Series, but there were not considered such at the time. They were two exhibition games, not a series to determine the world championship. Although they were exhibition games, they were taken seriously by the Cincinnatians. Although Fulmer was known primarily for his fielding prowess, not for his hitting, he was the hitting star of the first contest between the two league champions. The game was scoreless going into the bottom of the sixth inning. With one out, Hick Carpenter and Ecky Stearns hit safely, and Fulmer singled to center field, sending Carpenter home with the game’s first run. Fulmer was credited with the game-winning run batted in. Later in the inning he scored a run himself, as the Reds scored the only four runs of the game to win, 4-0. Cincinnati fans were jubilant. Their heroes had defeated the champions of the league that had snubbed them two years earlier. The fans celebrated with a cheer, “All yell, and let it be a champion whoop.”5 Although the Reds lost the second game of the series, they had proved their point. The champions of the upstart Association could compete on even terms with the champions of the haughty National League. Fulmer played for Cincinnati until his major-league career ended at the age of 33 on August 16, 1884. He wasn’t quite through with baseball, however. He played for Portland in the Eastern New England League in 1885 before hanging up his uniform for good. In 1886 Fulmer served as a National League umpire. The Sporting News reported that he carried a revolver concealed upon his person whenever he umpired a game. In every city in the league he obtained from the proper authorities a permit to carry the gun for self-protection. The paper warned, “So the hoodlums that infest different grounds should give the constable plenty of room.”8 The reference to Fulmer as “the constable” was because Fulmer worked in that capacity for the Philadelphia police department during the offseason. He also served his hometown as a magistrate for some time. In 1875 Charles Fulmer married Annie Virginia Wyatt, who had been born in Delaware in October 1856. The 1880 census showed Charles as a butcher, living with Annie, their two children, John Harry, 3, and one-year-old Charles Franklin, in Philadelphia. Chick’s father, Michael, still a butcher at age 67, was a member of the household. Of course, Chick spent the summer of 1880 playing baseball in Buffalo and Albany, but he spent the offseason in Philadelphia, working in his father’s butcher shop. The family cannot be located in the 1890 census, probably because the records for the part of Philadelphia in which they were living were destroyed in a warehouse fire. The federal decennial censuses for 1900, 1910, 1920, and 1930 all showed Charles Fulmer and his wife, Annie, living in Philadelphia. The 1900 census gave no occupation for Chick, but showed his son Charles living with his parents and employed as a clerk in the post office. In 1910 Chick’s occupation was listed as retired. His sister-in-law Amelia Evans and his niece Sarah Thomas were living in the household. The 1920 census designated Chick’s occupation as watchman for a publishing company. Before the next decennial census, Chick and Annie lived for a time in Atlantic City, New Jersey, where Chick was employed as a confectioner at the Ventnor Meat Market. In 1914 his son John Harry was working at the same market. Evidently, interest in butchering had been passed down from Chick’s father to his son. By 1930 Chick and Annie were back in the City of Brotherly Love, living as lodgers in a household headed by Rosina Jenkins. At age 79 Chick was employed as a doorman for the Curtis Publishing Company, probably the same company he had worked for 10 years earlier. At that time Curtis was one of the largest and most influential publishing houses in the United States, numbering among its publications the Saturday Evening Post and the Ladies’ Home Journal, and other periodicals. The skipper kept his promise as the Reds did win the pennant that year. Fulmer saw the Reds triumph in 1939, but did not live to see them win the pennant and the World Series the following year. Fulmer was not a great hitter; he never led his league in any major hitting category, although he was occasionally among the top 10 in one or another offensive stat. Defense was his strength. It was said that he was sure-handed and possessed a strong and accurate throwing arm.10 He led the American Association in putouts in 1882 and ranked among the top five in the league five other times. He ranked third or fourth in his league in assists by shortstops four times. He even made the leader board a few times when playing at second base or third base. Chick Fulmer was indeed a prototypical journeyman ballplayer. Charles John Fulmer died in Philadelphia on February 11, 1940, at the age of 89. He was survived by Annie, his wife for 65 years. According to his death certificate the principal cause of death was cardio-vascular renal disease. Contributing factors were arteriosclerosis, myocarditis, and atrial flutter. He was buried in the Fernwood Cemetery in suburban Philadelphia. Palmer, Pete, and Gary Gillette, eds. The Baseball Encyclopedia (New York: Barnes and Noble, 2004). 1 This event has not been documented. Fulmer’s account was reported by Joseph M. Overfield, “Charles John Fulmer (Chick)” in Nineteenth Century Stars, Robert L. Tiemann and Mark Rucker, eds. (Kansas City: Society for American Baseball Research, 1989), 49. 2 Edward Achorn, The Summer of Beer and Whiskey (New York: Public Affairs, 2013), 42. 3 Frank Hamilton, “Triple Plays,” tripleplays.sabr.org, July 31, 2006. 4 Achorn, op. cit., 133. 5 Jim Farmer, “The First Meeting of Champions,” in Bill Felber, ed., Inventing Baseball: The One Hundred Greatest Games of the Nineteenth Century (Phoenix, Arizona: Society for American Baseball Research, 2013), 148. 6 Achorn, op. cit., 248. 7 Achorn, op. cit., 250. 8 The Sporting News, August 16, 1886. 9 Achorn, op. cit., 250.